Swedish Ivy is a fast growing, spreading, evergreen perennial plant from South Africa that is closely related to the Coleus. They are not from Sweden, nor are they a true Ivy (Hedera). of tubular, pink, lilac or white flowers on fleshy stems that rise above the foliage. planted in moist, rich, well-drained soil, and grown in partial shade with a little morning sun. In cool summer regions, they can be grown in full sun. Water regularly and thoroughly while in active growth. Top-dress with compost each fall. When grown as a house plant, Swedish Ivy is very adaptable, but needs lots of bright, indirect light, with a few hours of direct sun each day to keep the plant's growth from becoming leggy. Swedish Ivy plants prefer to be kept somewhat rootbound but when it becomes necessary to re-pot them, they can be be planted in any good, fast draining, commercial potting soil. The foliage of Swedish Ivy tends to lose its glossiness if the plant is kept too dry. When your plant is actively growing, only allow soil to dry slightly between waterings before watering thoroughly. In the winter months, allow the top inch to dry before watering moderately. for more than a couple hours to prevent root rot, which is usually fatal. Feed your Swedish Ivy monthly from spring through summer, using a half strength solution of a soluble, all purpose fertilizer. Pinch back the tips to encourage branching near the ends of stems. Cut stems back hard to promote the overall bushiness of the plant. Deadhead spent flower spikes promptly! but it must be brought back indoors before the temperature drops below 50°. Swedish Ivy plants are susceptible to attacks from spider mites, scale insects and mealybugs, so inspect them regularly. Swedish Ivy Plants can be easily propagated with stem tip cuttings taken in the spring or summer and struck in moist potting soil or vermiculite. Swedish Ivy often self-layers at any point where the stem comes in contact with soil. Layering is a fairly quick method of propagating new plants. Pin a stem node to the soil in an adjacent pot or tray, using a piece of stiff wire bent into a U. Cover the pinned area with moist soil. Once the layer is well rooted, it can be severed from the parent repotted. 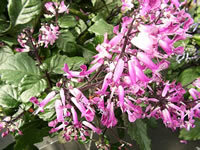 Plectranthus seeds require light for germination. Sow seeds indoors at any time for house plants, or 8-10 weeks before planting them in the garden in late spring after temperatures reach 50°. Maintain a temperature in the growing medium of 68°-75° until germination, which takes 10-14 days.